Given the alarmingly high prevalence of incidents in schools today, it is imperative to increase awareness about bullying and its impacts. The students of classes 7th & 8th of K.R. 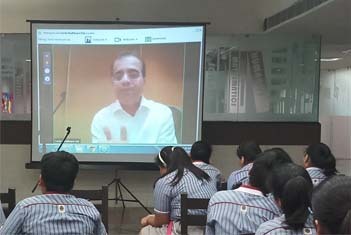 Mangalam World School Vaishali, got a wonderful opportunity to attend a one hour webinar session on the topic ‘Bullying’. The Department of Mental Health and Behavioural Sciences, Fortis Hospital, under the supervision of Dr. Samir Parikh, organized this webinar as a part of a year-long “Bully to Buddy campaign” on 27th September 2018. This interaction was geared towards equipping students with skills to deal with bullying effectively and also to help schools create an anti-bullying squad and work towards a preventive approach. The session focused on briefing the students about bullying, its types and strategies to deal with it. It was later followed by a Q & A session. It was well received by the students and they were really motivated to take it forward.